This plant is sensitive to overwatering and wet soils. Xeric plants are excellent for water conservation. They grow well in dry gardens with little to no supplemental watering once established. 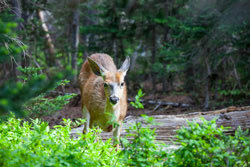 In fact, overwatering can harm these plants, which are native to dry environments such as deserts and chaparral. 1) In a humid region, you may find it difficult to grow plants native to semi-arid and arid environments. Yet xeric plants may succeed if you have a persistently dry area, such as under a roof overhang or in the shelter of a tree. 2) Xeric plants are excellent for locations far from garden hoses, such as along sidewalks -- areas often referred to as "hellstrips." 3) Shipping is hard on xeric plants, which suffer from confinement in small containers as well as boxes. You may see some mold, spots on leaves or withered foliage when they arrive. 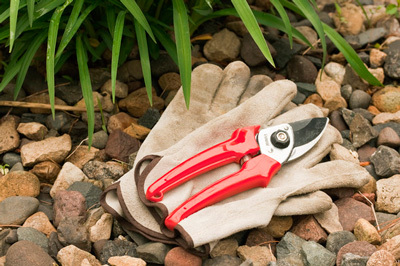 But xeric plants perk up with proper care while hardening off in partial shade before planting. 4) When amending soil before planting, remember that xeric plants not only need excellent drainage but also flower better in low fertility soil. Fertilize sparingly and use a mix with more phosphorous than nitrogen to encourage flowering and discourage lax overgrowth of foliage. 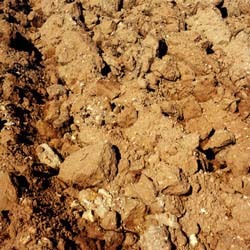 5) Organic matter, such as compost, is an excellent soil amendment for xeric plants, because it keeps their roots healthy by improving aeration and drainage. 6) When your xeric plants are established, water infrequently to encourage deep root growth and to avoid fungal problems. However, it's a good idea to gently spray dust off foliage about once a week. (Vicki Romo White Sage) A hybrid of two, top Californian natives, Vicki Romo has foliage very much like that of White Sage (Salvia apiana) and darker lavender flowers than those of Cleveland Sage (Salvia clevelandii). Vicki Romo is from the Rancho Santa Ana Botanic Garden where it was named after a graduate student intern. It has bigger, more pronounced flowers that bloom from spring into summer and is a bit less fragrant than its parent plants. 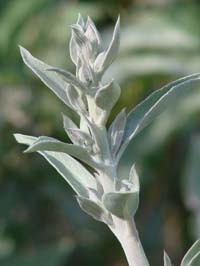 Similar to White Sage, it can grow up to 5 feet tall. However, unlike both of its smaller parents, Vicki Romo can spread up to 5 feet. This makes it economical as a border screen or tall groundcover. This heat-resistant, drought-tolerant shrub requires good drainage and full sun. Both parents have a dry-summer/wet-winter range and often grow on rocky, south slopes. Little water is needed once it becomes established. We love everything about this sage, especially how it attractst honeybees and hummingbirds but not deer. In the right locale, this plant survives and thrives despite minimal summer water. 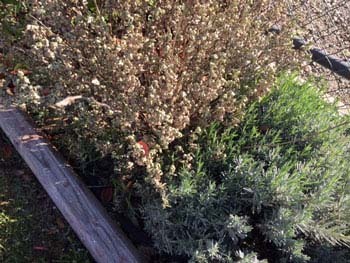 Drought resistance is an important characteristic of xeriscapic – dry landscape – plants, a category that includes a multitude of Salvias. Many low-water Salvias are native to parts of the world with little rainfall all year or regions where summers are dry and winters are wet. 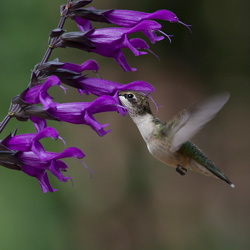 Nevertheless, there are also drought-resistant Salvias for places such as Florida where winters are dry and summers are wet. It isn't easy describing green in the garden. Foliage can span greens so pale they are almost white to blue-greens so deep they murmur the forest primeval. 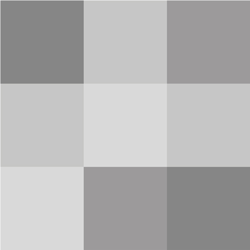 Amid this range, you'll find shimmering silver- and gray-leaf species. To locate these types of Salvias and companion plants in the Flowers by the Sea catalog, please visit our "Gray and Silver Leaf Plants" category in the FBTS catalog menu atop our homepage. This article includes a small sampler of our selection. Ask Mr. Sage: What Is Withering My Native Salvia? A California native sage that looks like it is suffering from drought may actually have root disease caused by a water mold called Phytophthora. Natives are affected by types of this pathogen that strike when soil is moist and temperatures are hot. Ask Mr. Sage is a regular feature of the Everything Salvias Blog and is based on calls and emails from customers. 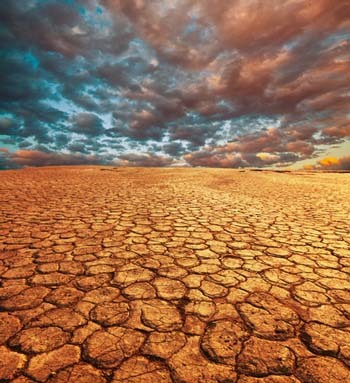 Drought is a shortage of precipitation over a season or more as in California where four years of drastic declines in rainfall and snowpack have created severe watering cutbacks. 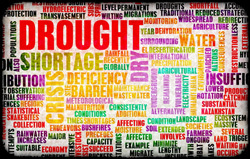 Drought is also defined by what and whom it affects from agriculture to homeowners. Flowers by the Sea Farm and Online Nursery explains drought and xeriscape, a water-conserving form of landscaping that is effective for gardening during drought and in dry climates. This article is part of the FBTS Getting Started series for gardeners becoming acquainted with Salvias (true sages). It includes a brief list of drought-resistant sages. 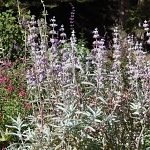 Bees and hummingbirds love the perennial subshrub Sacred White Sage (Salvia apiana) with its soaring spikes of white-to-lavender flowers that visually cool the landscape along with its large rosettes of lance-shaped, greenish-white foliage. 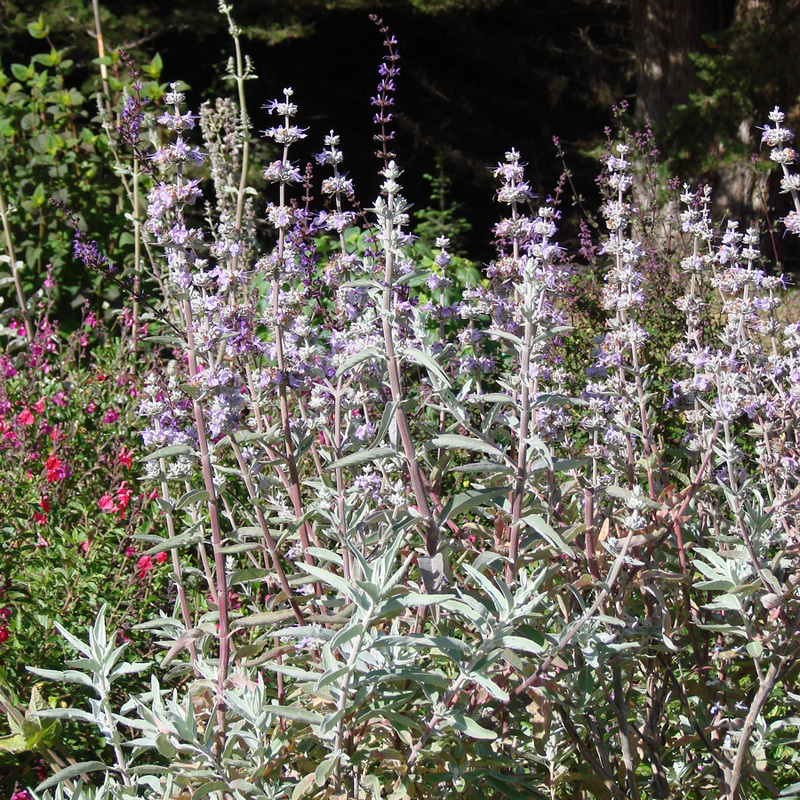 Sacred White Sage is far more than a pretty native plant of California. 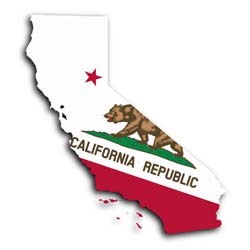 Historically, it provided food and medicine for a number of Native American tribes along the Pacific Coast. Today, bundles of Sacred White Sage leaves are still tied together to create torch-like wands called smudge sticks for fragrant purification ceremonies far beyond the Native American community. 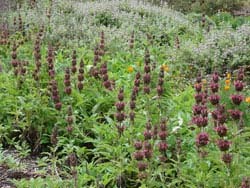 Synopsis: Drought resistant California native sages thrive when planted in fall. It's easier for roots to become established when soil is warm, air temperatures are cooler and precipitation is increasing. Ask Mr. Sage is a regular feature of the Everything Salvias Blog and is based on calls and emails from customers. Ask Mr. Sage answers questions based on calls and emails that Flowers by the Sea receives, such as concerns about what Salvias will grow in clay soils. This article talks about specific plants for dry and wet clay conditions, how to improve soil drainage and planting on slopes in wet areas. Native plants, including California's many indigenous sages, are like the boys or girls next door who were overlooked until outsiders discovered their good looks and other fine attributes. For the longest time, native species didn’t get respect in home gardening – a sizeable oversight considering that California alone has more than 5,500 native plants. Natives are roughly defined as species that were growing in America before European colonization. Flowers by the Sea cultivates hardy, drought-resistant California Salvias that are native to a broad swath of the West Coast ranging from Northern Baja to Southern Oregon. The California natives detailed here are all drought resistant and many tolerate heat. They are well suited to waterwise, xeriscapic landscapes, including dry gardens in which plants must survive despite almost no supplemental watering. this plant came in wonderful condition and doing well. ive potted it up into a soil less mix until its ready to be replanted outside in the spring with the other two salvias i ordered. thanks so much. im looking forward to growing it. 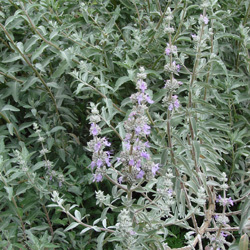 (Aromas Sage) Cleveland Sages are California native plants that are well known for their fragrance, especially on warm days. 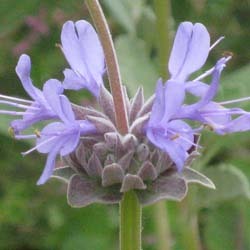 Salvia clevelandii 'Aromas' is particularly aromatic. It's also the tallest and one of the widest types of this full sun species that we grow. (Alpine Cleveland Sage) Powerfully fragrant and incredibly long blooming, Alpine Cleveland Sage is also the cold-hardyest variety of its species, tolerating temperatures well below freezing. - Woohooo! Happy 1st day of snrpig! I love the variety of your work! Your portraits are captivating and your floral/natural pictures are so beautifully composed. I will check you out often and I wish you a lovely snrpig. Very beautiful, full and healthy plants wrapped gently, perfectly. Less than 48 hours from N California to OKC! Wow! Yes! Will review each specimen as they grow.